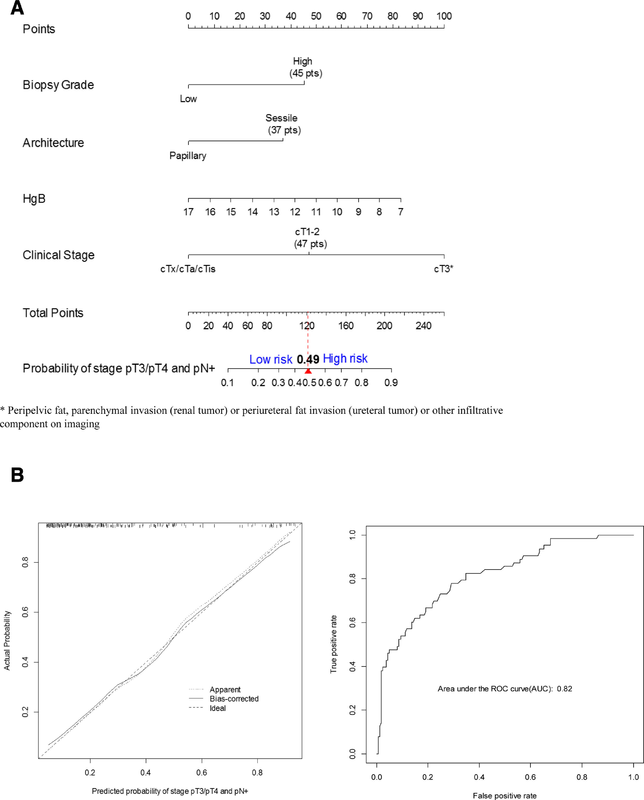 The current multivariable model showed clinical stage, biopsy tumor grade, tumor architecture, and hemoglobin level were independently associated with nonorgan-confined upper-tract urothelial carcinoma NOC-UTUC. Retrospective evaluation of 699 patients undergoing radical nephroureterectomy at 3 academic centers. Multiplex preoperative patient, imaging, endoscopic, and laboratory values were evaluated. Model derivation and validation were based on a split-sample method. Patients were divided randomly into a development (training) cohort (70% of patients) and validation (test) cohort (30% of patients). Univariate and multivariate logistic regression addressed the prediction of NOC disease (pT3/pT4 and/or pN+) based on training cohort. A backward stepdown selection process achieved the most informative nomogram. The ROC analysis identified a cut-off point predicting high-risk disease. The test cohort served as “external” validation to verify the findings based on the training cohort. Bootstrap resampling was conducted for both internal and “external” validation to evaluate the model fitting. Preoperative multiplex nomogram for prediction of high-risk nonorgan-confined upper-tract urothelial carcinoma. This preoperative nomogram can be used to more optimally select patients for preoperative systemic chemotherapy, and facilitate clinical trial enrollment.